A third of the UK population lived below the official poverty line at some point between 2010 and 2013, Britain’s Office for National Statistics (ONS) has said. But this group of the poor is constantly changing, the study shows. 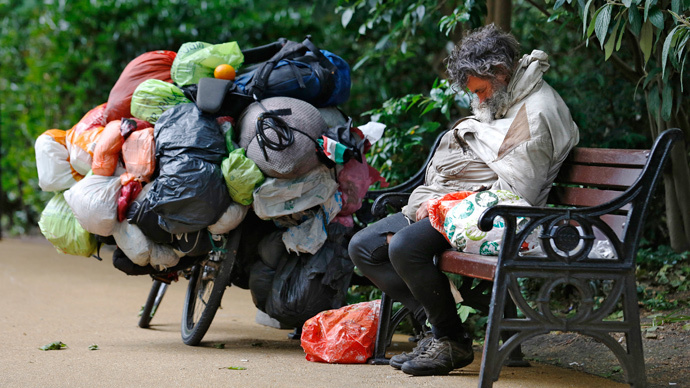 About 19.3 million people, experienced poverty in at least one year between 2010 and 2013, according to areleaseby Britain’s Office for National Statistics (ONS) published on Wednesday. “In contrast, across the EU as a whole, a quarter (25 percent) of people were in poverty at least once during that period, with a larger proportion of people in the UK experiencing poverty at least once over those 4 years than in many other EU country,” ONS added. The lowest level of so-called “persistent poverty” in the UK, which makes 7.8 percent, or 4.6 million people, compared to 15.9 percent in the EU signals that the chances of overcoming poverty are relatively high, according to the ONS. A person is considered living in poverty if he lives in a household with a disposable income below 60 percent of the national average. Persistent poverty means a person has been poor in the current year and at least two out of the three preceding years. The persistent poverty rate in Romania in 2013, by contrast, was 81 percent of the overall poverty rate, in Italy it was 69 percent. “These studies reveal that although some people are stuck in poverty, the majority of ‘the poor’ consist of a constantly changing group of different individuals,” the ONS said. The UK was ranked 13th out of the 28 EU member states for ‘overall poverty’ in a list topped by Greece, Romania, Bulgaria, Lithuania and Spain. The lowest levels of overall poverty were recorded in the Czech Republic, the Netherlands, Finland and Denmark. Britain was listed 20th in terms of persistent poverty with only the Czech Republic, Denmark, the Netherlands, Finland, Slovakia and Slovenia showing better results. Romania’s persistent poverty rates were considered highest, followed by Greece, Italy, Bulgaria and Spain. Retired people in the UK faced the highest risks of falling below the poverty line, with almost 40 percent of those above the age of 65 in the UK facing poverty at least once between 2010 and 2013, compared with less than 30 percent of those under 65. Three out of five of people living in single-parent households and almost half of those in single-adult households experienced poverty at least once between 2010 and 2013.